Mahanagar Telephone Nigam Limited (MTNL) has revised its 3G Data Packs in Delhi telecom circle. After the revision, the 3G data packs in Delhi now offer up to 300% more data when compared to existing benefits. However, the revision is valid for 90 days effective 07th August, 2017 and might be regularised after Promotional period. Mahanagar Telephone Nigam Limited (MTNL) offers 15 3G Packs for its customers in Delhi telecom circle. Starting with the 3G Pack 4, Mahanagar Telephone Nigam Limited (MTNL) now offers 120 MB for 1 day and the 3G Pack 19 now offers 750 MB for 1 day. The 3G Pack 42 now offers 1.5 GB for 3 days and the 3G Pack 50 now offers 300 MB for 30 days. The 3G Pack 76 now offers 3 GB for 7 days and the 3G Pack 99 now offers 1.5 GB for 30 days. 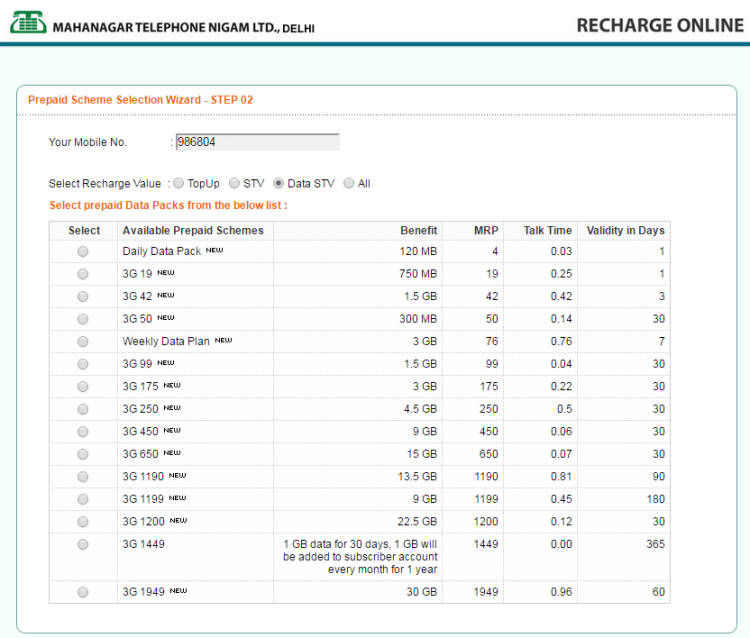 You can recharge these MTNL 3G Plans for Delhi on MTNL Website and on other Online Retailers like PayTM, MobiKwik.com etc.